Two sounds dominate the early 2009 auto market: Deafening silence from new-car showrooms and the sounds of axes being swung by automakers worldwide. At Honda, horsepower and pizzazz are on the chopping block, according to the British magazine Autocar. 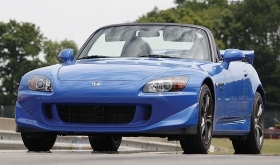 Plans for the successor to the S2000 sports car, a lineup of rear-drive Acuras, a proposed V-8 engine and a drop-top built off the CR-Z hybrid are all dead, according to the magazine. The reason: Honda is rethinking its product plans as it grapples with the global downturn in sales and economic conditions. In the United States, American Honda's sales fell 7.9 percent last year and 34.7 percent in December. Tough times already had killed the planned 2010 Acura NSX, which would have had a front-mounted V-10. Now Honda also has decided to shelve a rear-drive V-8 Acura that was meant to take on BMW in 2015, according to Autocar. The V-8 — long a thorny issue, given Honda's green image — was seen as the wrong powerplant because of the uncertain future of fuel prices.